Our specialty interior finishes are made by blending natural coloured pebble with high quality white cement to make a non-slip finish to your pool. Our pebble finishes are applied by our team of international Master pebble applicators who have many years of experience applying pebble products worldwide using specialised pebble tools and equipment to create the perfect finish. 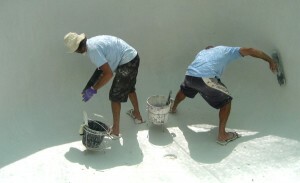 Preparation day: The process begins by firstly applying a bonding coat to the fully prepared and clean concrete structure to create a uniform surface for our Pebble-Pro finish to adhere to. 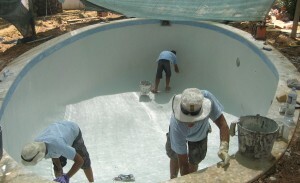 Pebble Application day: after setting the work site up with required equipment the pool surface is washed down and prepared while the first batch of material is mixed. 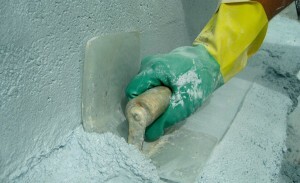 When thoroughly mixed it is passed to the applicators who apply the material directly on the concrete surface. The pebble is worked thoroughly and constantly until smooth. Once the material is at the correct hardness the surface is lightly jet wash to remove the cement cream. Acid wash and clean day: Using a mixture of acid and water the surface is washed to remove any excess cement cream, then washed again with a jet wash to remove any traces of acid. It is possible to immediately start filling the pool with clean water and start the filtration system as soon as pool is filled. 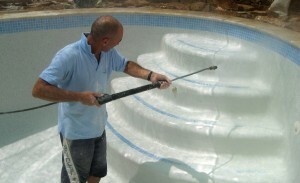 If your company is interested in broadening your range of pool interiors to include natural pebble finishes, we are able to offer pool companies in Europe the chance to be applicators of Pebble Pro. 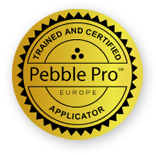 Our company can offer you full training and support for the application of the Pebble Pro range. Training can be provided either on one of your sites or we can offer you training on one of our existing sites/projects. We can offer you very competitive prices on our pebble stock along with the equipment and machinery you need. Our pebble range comes in 20kg bags in a base range of 5 colours, the great advantage of this it that there is no shelf life as with the pre-blended cement based products. You can blend the colours to a preset colour chart or experiment and create a range to suit your and your clients preferences. We have a range of oxides and glass beads available to add vibrant colours and textures to the colour range.